Waco Lock and Key now stocks, cuts and programs General Motors new switchblade keys. 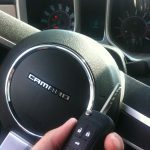 If you have ever seen the Volkswagen flip keys then these are similar in function, GM has created a very solid design. The switchblade snaps up and down with a solid, mechanical action. The key ring connection at the bottom seems very robust. It seems to be the highest quality switchblade key currently around. 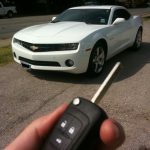 The 2010 Camaro was one of the first vehicles to use this key.